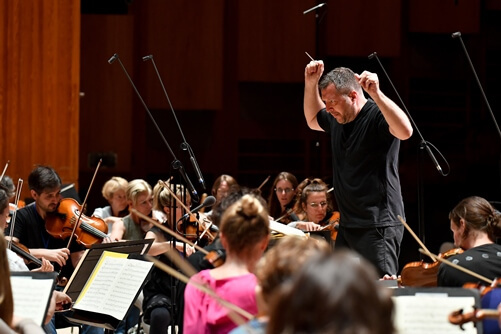 Britten Sinfonia’s Beethoven Symphony Cycle, conducted by Thomas Adès, concludes with Beethoven’s mighty ‘choral’ symphony and Gerald Barry’s feverish The Eternal Recurrence. Beethoven’s extraordinary Ninth Symphony is regarded by many as the finest of all symphonies, and its message of humanity, perhaps most famously encapsulated in the symphony’s Ode to Joy chorus, continues to resonate today (not least, as the anthem for the European Union). Here, Beethoven’s masterful celebration of the human race is paired with Gerald Barry’s The Eternal Recurrence, a brilliant, feverish setting of texts from Nietzsche’s philosophical novel Also sprach Zarathustra. Britten Sinfonia musicians discuss tonight’s programme.